Superposed strata in sedimentary rocks are believed to have been formed by successive layers of sediments deposited periodically with interruptions of sedimentation. This experimental study examines possible stratification of heterogeneous sand mixtures under continuous (non-periodic and non-interrupted) sedimentation. The three primary aspects of stratification are considered: lamination, graded-beds, and joints. Experiments on segregation of 11 heterogeneous mixtures of sand-size quartz, limestone and coal demonstrate that through lateral motion of a sand mixture, the fine particles fall between the interstices of the rolling coarse particles. Coarse particles gradually roll on top of fine particles and microscale sorting is obtained. Microscale segregation similar to lamination is observed on plane surfaces, as well as under continuous settling in columns filled with either air or water. The formation of graded-beds is examined in a laboratory flume under steady flow and a continuous supply of heterogeneous sand particles. Under steady uniform flow and plane bed with sediment motion, the coarse particles of the mixture roll on a laminated bed of mostly fine sand particles. In non-uniform flow, the velocity decrease caused by a tailgate induces the formation of a stratum of coarse particles propagating in the downstream direction. On top of this cross-stratified bed, fine particles settle through the moving bed layer of rolling coarse sand particles and form a near horizontally laminated topset stratum of finer particles. Over time, a thick stratum of coarse particles thus progresses downstream between two strata of laminated fine particles, continuously prograding upward and downstream. Laboratory experiments on the desiccation of natural sands also show preferential fracturing, or joints, of crusty deposits at the interface between strata of coarse and fine particles. Rather than successive sedimentary layers, these experiments demonstrate that stratification under a continuous supply of heterogeneous sand particles results from: segregation for lamination, non-uniform flow for graded-beds, and desiccation for joints. Superposed strata are not necessarily identical to successive layers. As stratification usually describes layering in rocks, a single layer of homogeneous lithology is referred to as a stratum. Stratification has often been associated with intermittent sedimentary layers. Superposed strata in sedimentary rocks are believed to have been formed by successive layers of sediment deposited periodically with interruptions of sedimentation. horizontal joints between sediment deposits. Table 1. Summary of hypotheses explaining the origin of horizontal lamination. Kuenen (1957)4 Velocity pulsations in turbidity current. Ksiazkiewicz (1952)5 Diluted secondary turbidity currents suspended above bed. Ten Haaf (1956)6 Sorting action of vortices by turbulence in turbidity currents. 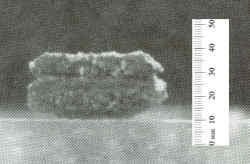 Hsü(1959)7 Settling and laminar flow of fluidized sediment along bed. Wood and Smith (1959)9 Settling from tail of turbidity current with non-uniform concentration. Lombard (1963)11 Small turbulent eddies. Current velocity pulses with settling or traction. Kuenen (1966)13 Grains of similar susceptibility to transport tend to deposit together, that is, spatial and temporal selection of similar grains due to grain interaction under quasi-steady flow condition - the ‘like-seek-like’ principle. Allen (1964)14 Pulsating sediment supply due to separate large-scale eddies. Upper regime plane bed. Walker (1965)15 Intermittent supply of mixed sediment to top of viscous sublayer followed by differential settling through; for finer grained laminae. Coarser grained laminae under upper regime plane bed. Sanders (1965)16 Settling and traction during current velocity fluctuation. Not upper regime plane bed. Jopling (1967)17 Attributed laminae to the superposition of longitudinal segregations of bedload grains under aggradation of an upper regime plane bed. Pettijohn (1975)19 Transitory phases or minor chance fluctuations in velocity of depositing current. Middleton (1970)20 Smaller grains filter down between larger ones during flow, thus displacing the larger ones towards the free surface. McBride et al. (1975)22 Migration of very low relief bedforms (diminished ripples and dunes). Frostick and Reid (1977)23 Combined the ideas of Pettijohn, Moss and Kuenen. 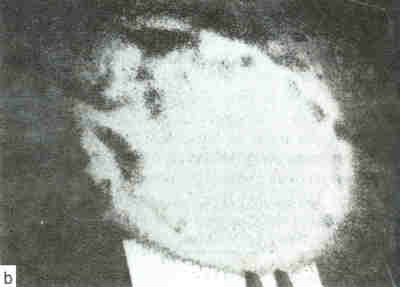 Bridge (1978)24 Described the possible lamination formation due to the effect of single burst-sweep cycle on a plane bed. Hesse and Chough (1980)25 Suggested that a horizontal lamination formed with multiple burst-sweep events on plane bed. Allen (1984)26 Laminae form due to the shifting distribution of boundary shear stress as large eddies move downstream over a plane bed. Bridge and Best (1988)27 Lamination form by both migration of low-relief bedwaves and the turbulent bursting process. Paola, Wiele and Rienhart (1989)28 Extremely low amplitude bedforms. 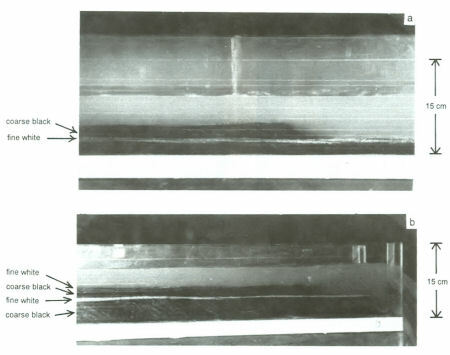 Initial deposition from small-scale turbulent fluctuations in shear stress followed by sieving out mechanism resulting in a smooth surface process termed glazing. Bridge42 proposed the ‘burst-sweep cycle’ in the turbulent boundary layers to explain the vertical sorting that defines laminae. Accordingly, bursts would cause upward dispersion of the suspended load throughout the flow; also some of the saltating load would carry coarser grains due to higher shear stress. As bed shear stress decreases, the dispersed particles settle down to form a laminated layer. Allen43 suggested a model based on the larger coherent structures of the turbulent boundary layers to explain the formation of horizontal laminae under a plane bed in the upper flow regime. Cheel and Middleton44 suggested that the probable mechanism for the formation of FU (fining- upward) and CU (coarsening-upward) laminae was the burst-sweep process. Unrug,45 and Wood and Smith,46 saw parallel lamination as caused by the segregation of the coarser grains into distinct clouds within the flow. Hsü47 attributed lamination to laminar flow at the bed. migration of low-amplitude bedforms that is neither upper nor lower flow regime. Guy et al.60 noted the sorting of coarse and fine sand particles in laboratory flumes. Middleton61 proposed that grading arose because smaller grains tended to filter down between the larger ones during flow, thus displacing the larger grains toward the free surface. This segregation mechanism is also referred to as ‘kinematic sieving’ in Allen.62 A sorting process was also advocated by Frostick and Reid.63 Berthault64,65 found that the thickness of laminae in still water increased as the difference between the size of particles became greater, and the laminar thickness also increased with the flow velocity of running water. horizontal joints at the interface between strata. The use of sand mixtures with coarse and fine particles of different colours ensures a better visualization of the sediment sorting, besides providing an assessment of the distribution of different particle sizes. This article summarizes several laboratory reports by Julien and Chen66,67 and Julien and Lan68-70 on recent laboratory experiments carried out in the Hydraulic Laboratory of the Engineering Research Centre at Colorado State University. through settling in air and water. Thirteen different sand-size materials have been used in the experiments. For each material the particle size distribution, mass density, angle of repose, angularity and colour are summarized in Table 2. Note that D10, D25, D50, D75 and D90 represent the particle size for which 10%, 25%, 50%, 75% and 90%, respectively, of the particles are finer. The measured angle of repose increases as the subjective (angular vs. rounded) microscopic observation of angularity increases. Both parameters indicate that ERC #1, ERC #2, ERC #3, ERC #5, limestone #1 and limestone #2 are rounded, while coal #1, coal #3, coal #4, B2040 and B3060 are angular. Equal weights of materials of different sizes and colours were mixed to form a total of 11 mixtures listed in Table 3. Table 3. Horizontal segregation of sand mixtures. Clear segregation. 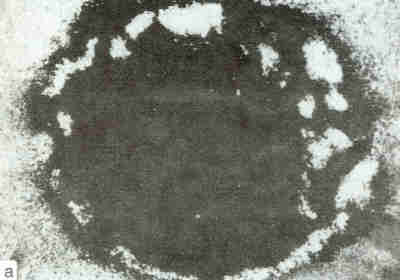 Coarse black particles on top of fine white particles (see Figure 1). Clear segregation. Coarse black particles on top of fine white particles. No clear segregation of particles. Clear segregation. Fine black particles on top of coarse white particles. No clear segregation is observed. Clear segregation. Fine black particles on top of coarse limestone particles. Clear segregation. Coarse black particles on top of limestone particles. Clear segregation. Coarse white particles on top of fine black particles. * Mixtures are comprised of equal weight of each material. Figure 1a. Clear segregation of mixture ERC #1 and B2040, from above. Figure 1b. Clear segregation of mixture ERC #1 and B2040, from underneath. Simple experiments were conducted to investigate possible segregation of sediment particles on a transparent horizontal plexiglas plate 30 x 40 cm2. A small volume (not exceeding 10cm3) of a given homogeneous sand mixture was poured onto the plate, which was then gently agitated manually for a few minutes in the horizontal plane of the Plexiglas plate. Pictures were then taken above and below the plate to examine whether segregation occurs. The same procedure was repeated for each sand mixture. Typical experimental results, shown in Figure 1, demonstrate how easy it is to segregate these two types of particles, with the finer white particles (ERC #1) underneath (see Figure la), and the coarser black particles (B2040) on top (see Figure 1b). coarse particles on top of fine particles (see Figure 1). Segregation of particles always takes place if the two types of particles in the mixture have different sizes or densities. The particle segregation diagram in Figure 2 illustrates the three types of particle segregation according to particle diameter D50 and mass density ρ of the data from Table 3. Figure 2. Particle separation diagram. The most fundamental mechanism explaining the segregation of heterogeneous mixtures of constant mass density starts from a uniform mixture of coarse and fine particles, as sketched in Figure 3. Only the lateral motion of the mixture in any direction is necessary to induce segregation. During lateral motion of the sand mixture in Figure 3a, the fine particles fall through the interstices between the coarse particles and reach the bottom of the moving layer, while the coarse particles start rolling on top of the fine particles (see Figure 3b). After a certain time, the fine particles stabilize at the bottom of the moving layer while the coarse particles remain mobile on top (see Figure 3c). In order to obtain segregation with particles of the same mass density, it is important that the fine particles be sufficiently small to fall between the interstices of the coarse particles, and also the coarse particles must be able to roll on top of the small ones. Particles of equivalent sizes and different densities also segregate with lighter particles on top of heavier particles. Figure 3. Sketch of the segregation process with constant particle mass density, before (a), during (b), and after (c) motion. Segregation is possible without bedforms and without turbulence; in that regard the segregation process is very different from the ‘glazing’ process suggested by Paola et al.72 Middleton73 and Allen74 also debated whether the dispersive shear stress arising from interparticle collisions exerts a significant influence on segregation. Given that the dispersive stress is proportional to the square of the rate of deformation, we repeated our experiments under extremely low rates of deformation without interparticle impact, thus negligible dispersive stress. The similar patterns that developed demonstrate that the segregation process results from the displacement of smaller grains between the coarser grains, rather than from high speed inertial impact between particles. Figure 4. Example of clear lamination in air (mixture #C). The objective of these experiments in a settling column was to examine possible repetitive segregation, or lamination, of various heterogeneous sand mixtures settling in air and in water. The visualization, of the repetitive segregation under continuous settling of these mixtures falling into a column filled with air or water, is possible through the Plexiglas sidewalls of a square, cylindrical settling column 10cm x 10cm x 84cm (see Figure 4). A valve was installed at both ends of the cylinder to supply or drain water during and/or after experiments. Photographs were taken from the sides of the column, and the sorting characteristics of various mixtures with different densities, sizes and shapes were documented. A homogeneous mixture was poured at a constant rate (see Table 4) into the cone at the top of the cylinder. The valve controlling the settling rate was then opened to let the mixture settle directly near the centre of the stationary cylinder. During most experiments in air, the splashing of particles after impact was significant, owing to high fall velocities of the particles. The saltating distance of particles reached 5cm from the point of impact. In many instances, no laminae formed when rolling of one type of particles on the other was not obvious. Splashing was reduced by raising the base height of the settling column. Clear repetitive segregation, or lamination, was shown in at least two experiments. In such, cases as mixture #C, black particles rolled on top of white particles before landsliding, resulting in clear lamination with thickness less than 0.5cm. The experimental results for each often different mixtures of quartz, limestone and coal are summarized in Table 4, for both runs in air and in water, respectively. Generally speaking, mixtures forming laminae in air often form laminae in water. However, cases such as mixtures #0 and #1 do not form laminae in water because coal particles settle very slowly in water. When the cylinder was slightly inclined at an angle of approximately 5°, the experiment with mixture #C highlights the importance of the rolling distance of the moving layers. Lamination becomes clearer as the rolling distance increases. The laminae thickness, however, remains unaffected by the inclination angle of the cylinder. mixtures of different particle density and different particle size—mixture #D.
Laminae can be produced in both air and water. In air, splashing of the particles becomes predominant as the mixture gets coarser due to higher fall velocity. Splashing is greatly reduced in water, although the turbulence induced by the settling of coarser particles enhances suspension of finer particles. The settling of such mixtures becomes more uniform in that no laminae can be found because the segregation mechanism does not take place. Under a continuous supply of sediment, lamination is found to be essentially the result of the mechanical interaction between particles of different size, shape and density. The segregation process of heterogeneous sand mixtures under lateral motion is the primary cause of lamination (see Figure 3). Segregation results from the rolling of one particle over the other, and lamination is possible without fluid turbulence and without the migration of low amplitude bedforms. Superposed laminae cannot be identical to discontinuous sedimentation into successive layers. Figure 5. Small recirculating flume. Laboratory experiments on graded-beds were conducted to determine whether stratification of heterogeneous sand mixtures is possible under steady flow and a continuous supply of sand particles. As opposed to segregation and lamination where sorting of particles occurs at a scale not exceeding a few millimetres, the graded-beds experiments determine whether graded-beds of coarse and fine sands at a scale exceeding 10mm are possible. The flow conditions examined in the laboratory flume are - that is, upper regime plane bed-flow conditions similar to those of Bijou Creek during the 1965 flood. 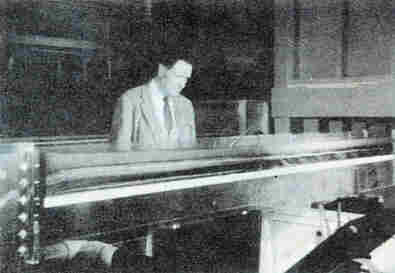 Laboratory experiments on graded-beds were carried out in a tilting Plexiglas flume (0.15m wide, 0.15m deep, and 2.40m long) (see Figure 5). The flume recirculates both water and sediment in order to provide a continuous supply of heterogeneous sand particles under steady flow conditions during the course of each experiment. Particular design consideration of the headbox and the entrance profile of the flume ensured complete sediment mixing and steady inflow of sediment. Table 5. Summary of graded-bed measurements. Prior to each experiment, the flume slope was set (horizontal, positive, or adverse slope). The flow rate was controlled by a gate valve and measured by a Venturi orifice. The flow of water and sediment first ran freely near critical flow conditions, without downstream gate control until reaching the equilibrium plane bed with sediment transport. Starting from equilibrium plane conditions, the deposition of sand in the flume in non-uniform flow was induced by inserting a first tailgate, 0.15m wide and 0.02m high, at the downstream end of the flume. The water depth and the thickening sediment deposits were measured through the transparent sidewall of the flume. Local velocity measurements upstream and downstream of the delta were taken using an Ultrasonic Doppler Velocimeter Model UDV-H9, with an accuracy of +0.003 m/sec or 2% of reading, whichever was greater. Measurements of discharge, surface velocity and depth were taken and compiled, and the progression of the deltaic sediment deposits was recorded (see Table 5). The new deposit reached the downstream end of the flume about 20 to 30 minutes after inserting the tailgate, and new equilibrium conditions were then obtained. After completing the measurements, the second gate was inserted to form a second deposit and the documentation procedure was repeated. Figure 6a. Schematic formation of graded-beds. Figure 6b. Time sequence of deposit formation for t1 < t2 < t3. This experimental procedure clearly demonstrated the formation of stratified graded-beds. A schematic description of the formation of graded-beds is sketched on Figure 6. Under initial steady uniform flow conditions and a continuous supply of heterogeneous sand-size particles, coarse particles roll on a bed of fine sand particles. The plane bed laminated deposit is comprised mostly of fine sand particles. The insertion of a single tailgate induces first the formation of a deltaic stratum of coarse black particles which propagates in the downstream direction. On the delta, fine particles cover the topset slope, while coarse particles roll on a laminated bed of fine particles. Coarse particles settle on the foreset slope of the delta, which progresses in the downstream direction (see Figure 7). On the top of the delta, the fine white particles in the moving layer of rolling black particles deposit on the topset deposit of fine white particles. The thickness of the laminated topset deposit gradually increases until the delta foreset reaches the downstream end of the flume. Typical cross-sectional and longitudinal views of the deposit after a single tailgate has been inserted clearly illustrate the stratified nature of the deposit of coarse black particles between two laminated deposits of finer white particles (see Figure 8). Figure 7a. Example of graded-beds with first tailgate. Figure 7b. Example of graded-beds with second tailgate. Elaborate descriptions of the deposits for each run (4 sets with mixture SM2 identified as SM2A to SM2D, and one set with mixture SM3 noted as SM3A) are found in Julien and Chen.77 Flume bed slopes are given in Table 5 for each set of runs. The horizontally laminated (H-Lam) layer thickness was examined in terms of depth-averaged velocities upstream Vu and downstream VD at the tip of the delta in Table 5. It was found that for the runs SM2A, Vu varies slightly, although VD and H-Lam significantly increase with discharge. At a comparable discharge, the runs SM2D showed an expected increase in delta thickness with gate height. With positive slope, runs SM2C, the results were similar to those with horizontal slope (SM2A), except that the thickness of deposits was less sensitive to changes in discharge. Under adverse slopes, runs SM2B, the thickness variability with discharge was also less significant. Figure 8a. Typical cross-sectional view of deposit. These results primarily show that the delta thickness increases as VD decreases, while Vu remains fairly constant (Vu ~ 50 cm/s). The effect of slope shows that the delta and H-Lam thicknesses vary with discharge for horizontal slope. Results are uncertain for both positive and adverse slopes. In summary, the velocity change in the downstream direction induces selective settling of particles of different sizes, thus forming graded-beds which develop in the downstream direction. These observations of graded-bed formation highlight the simultaneous development of topset and foreset deposits (see Figures 6 and 7). A laminated stratum of fine particles forms on top and at the base of a cross-stratified foreset stratum of coarse particles. The time sequence of the formation of this stratified deposit shows that sets of laminae develop vertically upward and propagate downstream as the cross-stratified bed of coarse particles progresses in the downstream direction. At a microscopic scale on the surface of the deposit, the coarse particles roll on a bed of fine particles in a manner very similar to the segregation process shown in Figure 3 and described in the first part of this experimental program. The experiments demonstrate that stratified deposits can form in steady non-uniform flow under a continuous supply of fine and coarse sediment particles. The procedure used was similar to that of the flume experiments discussed in the previous section. The graded-beds left in the flume after the experiment were exposed to solar lights for seven days until complete desiccation o the deposit. Figure 9. Horizontal fracturing of the Bijou Creek sand. No vertical cracks were found in the stratified deposit after seven days under solar lights, which may be attributed to the low silt and clay content (less than 1% ) of the hard crusted deposit. The horizontal planes, or joints, between the crusted finer sands and the coarser sands separated easily as shown in Figure 9. These joints separating particles of different sizes constitute preferential plane for the propagation of fractures in dried sediment deposits. These experiments simply support previous observations that joints can result from desiccation and not necessarily from periods without sediment settling. This fundamental study demonstrates the usefulness of laboratory experiments in the analysis of stratification of heterogeneous sand mixtures. Upper flow regime conditions similar to the Bijou Creek flood can be reproduced in the laboratory, and clear stratification of heterogeneous mixtures is evidenced by using coarse and fine sand grains of different colours. Lamination essentially results from the mechanical segregation of heterogeneous particles in a moving layer. Lamination is possible without turbulence and without the migration of low amplitude bedforms. Through lateral movement of particles of constant mass density, finer particles fall within the interstices of rolling coarser particles. Coarse particles then roll on top of fines and microscale segregation of particles is then obtained. The degree of segregation depends on particle size distribution, density, and possibly angularity of heterogeneous sand mixtures (see Figure 2). Repetitive segregation is also possible in settling columns where lamination is clearly observed both in air and water. Sufficient space, or rolling distance, is required for clear lamination to develop in moving layers of heterogeneous particles. Particles of comparable size but different densities segregate similarly, with heavier particles falling between lighter particles. The graded-bed experiments clearly demonstrate the simultaneous formation of stratified deposits under steady flow conditions and a continuous supply of heterogeneous particles. The deposition process involves the formation of a stratum of coarse particles between laminated deposits of fine particles as a result of velocity changes in non-uniform flow. The time sequence of the deposit formation shows that sets of laminae develop vertically upward and progress in the downstream direction. At a microscopic scale, at the surface of the deposit, coarse particles roll on a deposit of fine particles as a result of particle segregation. Desiccation experiments on the Bijou Creek sand deposits in laboratory flumes indicate preferential fracturing of the crusty deposit along horizontal planes, or stratification joints, separating graded-beds of coarse and fine particles. On the other hand, no vertical cracks were observed in the experiments, which may be explained by the low clay content of the Bijou Creek sand. In summary, these experiments demonstrate that stratification of heterogeneous sand mixtures can result from: segregation for lamination, non-uniform flow for graded-beds, and desiccation for joints. Therefore, superposed strata are not necessarily identical to successive sedimentary layers. The writers would like to thank Messrs Berné and Postma, and editorial advisor Mr Séguret for their insightful suggestions in the review of this publication. This piece of original research was first published with the same title and authors in the Bulletin of the Geological Society of France, vol. 164(5), 1993, pp. 649-650. We are grateful to the Société Géologique de France for permission to publish this English version of the paper. The Society requests that the original paper should always be cited, and wishes it to be noted that it is not responsible for the ideas expressed in the paper. McKee, E. D.. Crosby, E. J. and Berryhill, H. L., Jr., 1967. Flood deposits, Bijou Creek, Colorado, June, 1965. Journal of Sedimentary Petrology, 37:829-851. Return to text. Kuenen, Ph. H. and Ménard, H. W., 1952. Turbidity currents, graded and non-graded deposits. Journal of Sedimentary Petrology, 22:86-96. Return to text. Kuenen, Ph. H.,1953. Significant features of graded bedding. Bulletin of the American Association or Petroleum Geologists, 74:523-545. Return to text. Kuenen, Ph. H., 1957. Sole markings of graded greywacke beds. Journal or Geology, 65:231-258. Return to text. Ksiazkiewicz, M., 1952. Graded and laminated bedding in the Carpathian flysch. Ann. Sac. Geol. Pologne, 22:399-499. Return to text. Ten Haaf, E., 1956. Significance of convolute lamination. Geol. Mijnb., 18:188-194. Return to text. Hsü, K. J., 1959. Flute- and groove-casts in the Prealpine flysch, Switzerland. American Journal or Science, 257:529-536. Return to text. Unrug, R., 1959. On the sedimentation of the Lgota beds, Biesle area, western Carpathians. Racz. Pol. Tow. Geol., 29:218-223. Return to text. Wood, A. and Smith, A J., 1959. Sedimentation and sedimentary history of the Aberystwyth Grits (Upper Llandoverian). Quarterly Journal of the Geological Society of London, 114:163-195. Return to text. Bouma, A M., 1962. Sedimentology of Some Flysch Deposits; a Graphic Approach to Facies Interpretation, Elsevier, Amsterdam, 168p. Return to text. Lombard, A., 1963. Laminites: a structure of flysch-type sediments. Journal of Sedimentary Petrology, 33:14-22. Return to text. Moss, A J., 1963. The physical nature of common sandy and pebbly deposits, part II. American Journal or Science, 261:197-243. Return to text. Kuenen, Ph. H., 1966. Experimental turbidite lamination in a circular flume. Journal of Geology, 74:523-545. Return to text. Allen, J. R. L, 1964. Primary current lineation in the Lower Old Red Sandstone (Devonian) Anglo-Welsh basin. Sedimentology, 3:89-108. Return to text. Walker, R. G., 1965. The origin and significance of the internal sedimentary structures of turbidites. Proceedings of the Yorkshire Geological Society, 35:1-32. Return to text. Sanders, J. E., 1965. Primary sedimentary structures formed by turbidity currents and related re-sedimentation mechanisms. In: Primary Sedimentary Structures and their Hydrodynamic Interpretation, G. V. Middleton (ed. ), Society of Economic Paleontologists and Mineralogists, Special Publication 12, pp. 192-329. Return to text. Jopling, A.V., 1967. Origin of laminae deposited by the movement of ripples along a streambed: a laboratory study. Journal of Geology, 75:287-305. Return to text. Pettijohn, F. J., 1957. Sedimentary Rocks, Harper and Row, New York, second edition, 718 pp. Return to text. Pettijohn, F. J., 1975. Sedimentary Rocks, Harper and Row, New York, third edition, 628 pp. Return to text. Middleton, G. V., 1970. Geological Association of Canada, Special Paper 7:253-272. Return to text. Smith, N. D., 1971. Pseudo-planar stratification produced by very low amplitude sand waves. Journal of Sedimentary Petrology, 41:69-73. Return to text. McBride, E. F., Shepherd, R. G. and Crawley, R. A., 1975. Origin of parallel. near-horizontal laminae by migration of bed forms in a small flume. Journal of Sedimentary Petrology, 45:132-139. Return to text. Frostick, L. E. and Reid, I., 1977. The origin of horizontal laminae in ephemeral stream channel-fill. Sedimentology, 24:1-9. Return to text. Bridge, J. S., 1978. Origin of horizontal lamination under turbulent boundary layer. Sedimentary Geology, 20:1-16. Return to text. Hesse, R. and Chough, S. K., 1980. The Northwest Atlantic Mid-Ocean Channel of the Labrador Sea: II. Deposition of parallel laminated levee muds from the viscous sublayer. Sedimentology, 27:697-711. Return to text. Allen, J. R. L, 1984. Parallel lamination developed from upper-stage plane bed: a model based on the large coherent structures of turbulent boundary layer. Sedimentary Geology, 39:227-242. Return to text. Bridge, J.S.and Best, J. L, 1988. Flow, sediment transport and bedform dynamics over the transition from dunes to upper-stage planebeds: implications for the formation of planar laminae. Sedimentology, 35:753-763. Return to text. Paola, C., Wiele, S. M. and Reinhart, M. A., 1989. Upper-regime parallel lamination as a result of turbulent sediment transport and low-amplitude bed forms. Sedimentology, 36:47-59. Return to text. Hjulström, F., 1935. The morphological activity of rivers as illustrated by River Fyris. Bulletin of the Geological Institute (Uppsala), 25, Chapter III. Return to text. Bridge, Ref. 24. Return to text. Cheel, R. J. and Middleton. G. V., 1986. Horizontal laminae formed under upper flow regime plane bed conditions. Journal of Geology, 94:489-504. Return to text. Allen. Ref. 26. Return to text. Kuenen and Menard, Ref. 2. Return to text. Kuenen. Ref. 3. Return to text. Kuenen. Ref. 4. Return to text. Ten Haaf, Ref. 6. Return to text. Pettijohn. Ref. 18. Return to text. Pettijohn. Ref. 19. Return to text. Bouma, Ref. 10. Return to text. Lombard, Ref. 11. Return to text. Allen. Ref. 14. Return to text. Cheel and Middleton. Ref. 31. Return to text. Unrug, Ref. 8. Return to text. Wood and Smith. Ref. 9. Return to text. Hsü, Ref. 7. Return to text. Jopling, A. V., 1965. Laboratory study of the distribution of grain size in cross-bed deposits. In: Primary Sedimentary Structuctures and their Hydrodynamic Interpretation, G. V. Middleton (ed. ), Society of Economic Paleontologists and Mineralogists, Special Publication 12, pp. 53–65. Return to text. Jopling, Ref. 17. Return to text. Jopling, A. V. and Walker, R. G., 1968. Morphology and origin of ripple-drift cross-lamination. with examples from the Pleistocene of Massachusetts. 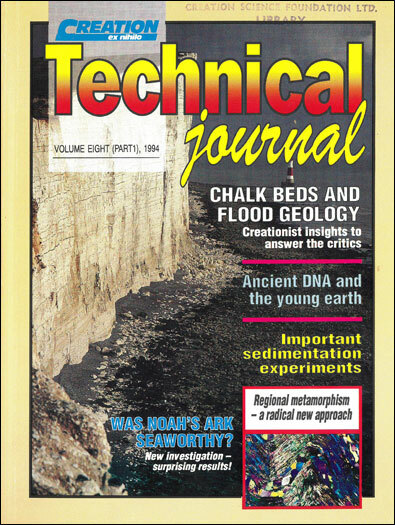 Journal or Sedimentary Petrology, 38:971-984. Return to text. Smith. Ref. 21. Return to text. McBride, Ref. 22. Return to text. Allen. J. R. L, 1982. Sedimentary Structures, Their Character and Physical Basis. Developments in Sedimentology, Vol. 30B, II, Elsevier, Amsterdam, 593 pp. Return to text. Paola et al., Ref. 28. Return to text. Bridge and Best, Ref. 27. Return to text. Moss, A. J., 1962. The physical nature of common sandy and pebbly deposits, part I. American Journal or Science, 260:337-373. Return to text. Moss, Ref. 12. Return to text. Kuenen. Ref. 13. Return to text. Guy, H. P., Simons, D. B. and Richardson. E. V., 1966. Summary of alluvial channel data from flume experiments 1956-1961. U.S. Geological Survey Paper 462-I, 96 pp. Return to text. Middleton. Ref. 20. Return to text. Allen, Ref. 53. Return to text. Frostick and Reid, Ref. 23. Return to text. Berthault, G., 1986. Sedimentology-experiments on lamination of sediments. C.R. Academie or Science (Paris), 303 (Series II, no. 17):1569-1574 (EN Tech. J., 3, 1988, pp. 25-29). Return to text. Berthault, G., 1988. Sedimentation of a heterogranular mixture-experimental lamination in still and running water. C.R. Academie of Science (Paris), 306 (Series II):717-724 (EN Tech. J., 4, 1990, pp.95- 102). Return to text. Julien. P. Y. and Chen, Y. C., 1989. Experimental study of horizontal lamination in a circulating flume. Civil Engineering Report CER88- 89PYJ- YCC14, Colorado State University, Fort Collins, Colorado, 63 pp. Return to text. Julien, P. Y. and Chen, Y. C., 1989. Experimental study of the deposition and drying of Bijou Creek Sand in a recirculating flume. Civil Engineering Report CER89-90PYJ-YCC4, Colorado State University, Fort Collins, Colorado, 35 pp. Return to text. Julien, P. Y. and Lan, Y.Q., 1989. Experimental formation of alluvial channel in wide rectangular flume. Civil Engineering Report CER89-90PYJ-YQL2, Colorado State University, Fort Collins, Colorado, 29 pp. Return to text. Julien, P. Y. and Lan, Y.Q., 1990. 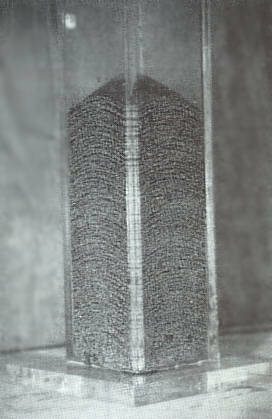 Sedimentation of heterogranular mixtures in a vertical cylinder. Civil Engineering Report CER89-90PYJ- YQL13, Colorado State University, Fort Collins, Colorado, 48 pp. Return to text. Julien, P. Y. and Lan, Y. Q., 1990. Laboratory experiments on lamination, stratification and desiccation. Civil Engineering Report CER89- 90PYJ-YQL15, Colorado State University, Fort Collins, Colorado, l77 pp. Return to text. Julien and Lan, Ref. 70. Return to text. Paola, et al., Ref. 28. Return to text. Middlelon, Ref. 20. Return to text. Julien and Chen, Ref. 66. Return to text. Julien and Chen, Ref. 67. Return to text. McKee et al., Ref. 1. Return to text.